This follows a BBC Spotlight programme broadcast this evening. 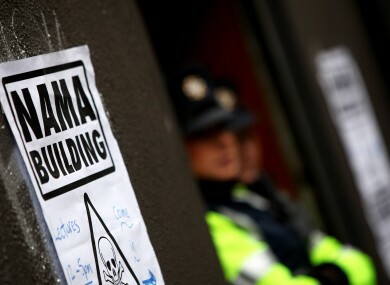 THERE HAS BEEN a significant breakthrough in the Nama controversy. The BBC Spotlight programme broadcast this evening has shown businessman Frank Cushnahan claiming that he was due to be paid a fixer fee in relation to a deal involving the Irish bad bank. During the course of the programme this was shown as part of a covert recording. Cushnahan has previously denied that he was due to receive money for his role in any deal. Nama’s entire loan portfolio was sold to the Cerberus investment fund in 2014. After its inception in 2009, Nama had controlled a huge property book in Northern Ireland, and had set up a committee in the region to handle it. Tonight : #spotlightni uncovers a scandal at the heart of the billion pound sale of NI property loans by the Irish debt agency NAMA. According to the BBC, Cushnahan – who had been appointed to that committee by the DUP – began negotiations with US investment fund Pimco about the possibility of buying the entire portfolio. He did this without Nama’s knowledge at the time. It is alleged that once the bad bank found out about his role, the deal fell through. The recording of Cushnahan appears to show him discussing a fixer’s fee for the subsequent deal between Nama and the eventual purchasers of the loan book – Cerberus. During BBC Spotlight’s secret recording Cushnahan is heard talking about work he did with a Belfast solicitor and stating the importance of his role, and that it was deliberately hidden because of objections from Nama. Last year when the controversy last raised its head, the businessman said he had never had any “meetings, dealings, correspondence or contact of any kind” with the group. Previously, independent TD Mick Wallace has submitted questions to Nama asking whether or not Frank Cushnahan had ever met with US investment fund personnel. In a statement issued to the BBC Spotlight programme, property developer John Miskelly said that he had reported financial misconduct to the US Securities and Exchange Commission in relation to the Project Eagle sale. He also said he was aware of a number of other incidents of financial misconduct. Comments have been closed on this article. Email “There has been a BIG breakthrough in the Nama controversy ”. Feedback on “There has been a BIG breakthrough in the Nama controversy ”.